I was formally recognised as a Sifu by Shigong Kim Han on 4th January 2010. I began my martial art training in 1976 at Coxheath Shotokan Karate Club with Sensei Ray Fuller. I managed after several years of hard work to achieve my 2nd Black Belt and became an Instructor for Sensei Fuller. After ten years of training at Coxheath I decided to commit to training under the guidance of Sifu Chris Ellerker, Chief Instructor of the Chinese Chang Chuen Shu Kung Fu style (aka Northern Shaolin Long Fist) . This proved to be a pivotal change in my thinking and my martial arts career. 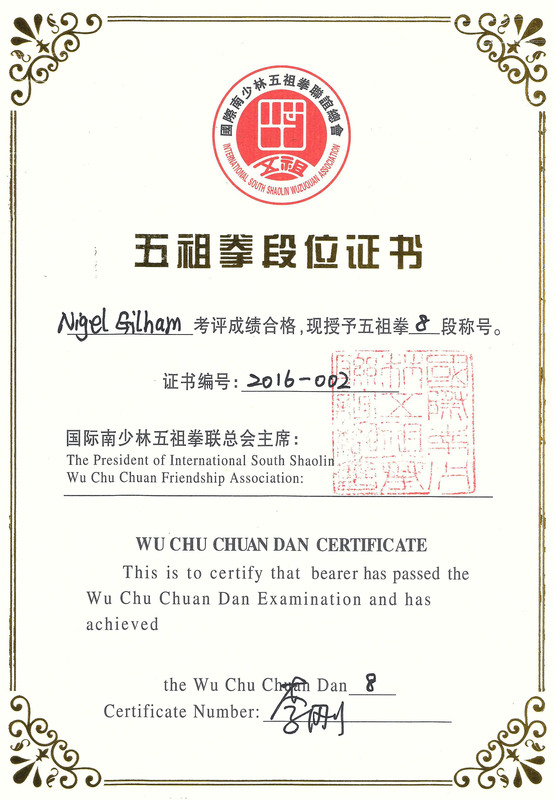 Chris has helped me to achieve many things including meeting Shigong Kim Han, achieving my 3rd Dan level in Chang Chuen Shu, becoming a member of the British Wu Shu Team and competing in the 1990 Wu Shu World Championships held in Kuala Lumpur, Malaysia. During my times with the British Wu Shu Team I have been very fortunate to travel to Europe and the Far East to compete and train with some of the best coaches and athletes in the country and the world. I have been very pleased to win gold medals in International Competitions, my most memorable being in the International Nan Shaolin Wuzu Quan Championships in China 2006. I travelled to China with the British Team and Coach (Shigong) Kim Han. During the competition all of the Teams was treated to AMAZING trips and exhibitions in places of interest in and around the area including the Southern Shaolin Temple in Quanzhou, Fujien Province. One of the highlights of the tour was to be asked to perform in a demonstration at the Shaolin Temle with my wife, Tracy. The other and proudest highlight of my the competition career was the presentation of a statue of ‘Dhamo’ as a distinction for the 5 Gold medals we jointly won in this competition (Nigel 2 Gold, Tracy 3 Gold). In 2010 both Tracy and I travelled to China once again for the competition. This time I was pleased to be appointed by Shigong Han as the official Team Coach to both the British and Irish Teams. In 2012 I was honoured to be invited to accompany Shigong Han as a UK delegate to a meeting of the International Nan Shaolin Wuzuquan Union in Quanzhou, Southern China. There I was able to meet some of the best Southern Shaolin masters, train with top students at the south Shaolin Temple in Quanzhou and have a amazing lunch with the Abbott of said Temple. I along with other KIXX Martial Arts Team members, have taken part and won a number of medals in many of the competition circuits around the UK eg; BCCMA, Combat, WFFO, EMA, WAKO, WKA, CIMAC, BNMA, etc, and abroad at Traditional and Wushu events in France, Germany, Holland to name a few. 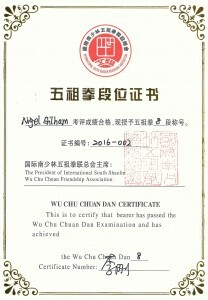 I have been very pleased and humbled by the experiences gained under the tutelage of Shigong Han, namely, travelling to China and Malaysia to take part in very high profile Far Eastern competitions and demonstrations, meeting some of the most impressive martial artists in the world, seeing them perform and having access to training with some of the very top people in their fields. To expand, improve and develop KIXX Martial Arts Club and make First Rate the quality of all that is on offer to our students and customers alike. To work and train with people that are interested in Martial Arts. To train more with Grand Master (Shigong) Han to maintain and improve my standard.